When a couple mutually agrees to separate i.e. they both agree to take a divorce and live separately then in that scenario, mutual divorce agreement which is also known as divorce agreement is filed. This is surely the simplest of all the divorce agreements because in this case, both the husband and the wife have agreed to call off their relationship. And this is a formal way of putting an end to the association of marriage between the husband and the wife. In a marriage, husband and wife don’t just share their lives but they also share their children, finances, properties, loans etc. Therefore, when we talk about a divorce agreement then in that case various other segments are included in it. Some of these are divorce property settlement agreement, divorce financial agreement etc. And while submitting the divorce agreement, there is complete disclosure of every aspect of their association like finances, property, children etc. in the form of both the parties involved in it. To help you with, we have come up with a sample of divorce agreement template. You can use this example which is in ready to format and is very simple. 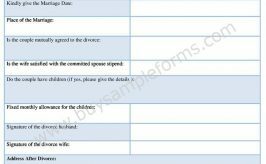 Just click and download this Divorce Agreement Template Form which comes with easy customization. Find this sample format drafted in Word format and PDF file which is easy to edit.